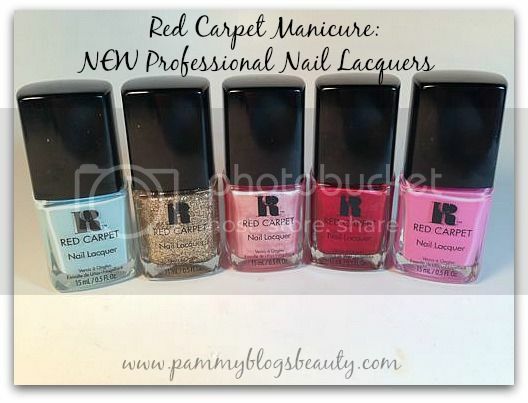 Pammy Blogs Beauty: Red Carpet Manicure now has Professional Nail Lacquers! Red Carpet Manicure now has Professional Nail Lacquers! Did you know that Red Carpet, the brand famous for their at-home LED gel polish system, now has Professional Nail Lacquers? That is right, these polishes need no lamp to cure! The collection’s shades range from whites and nudes to a variety of pinks, corals and blues. Additionally, 18 shades in the collection are color-matched to Red Carpet Manicure’s LED gel polish line. I really love the assortment of Red Carpet lacquers that I tried out from this collection! I tried the following shades: After Party Playful (my favorite! a light purplish pink creme), Glitz & Glamourous (a deep red with a slightly metallic sheen), My Secret Admireer (light pastel pink metallic), A-List Only (a gorgeous gold glitter: gives full coverage in 2 coats), and On Cloud 9 (sky blue creme). I am in the midst of testing out Red Carpet's gel system. So, stay tuned for that review coming soon! 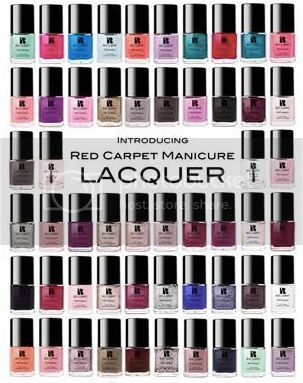 Have you tried out Red Carpet's gel system or their new line of lacqures? I would love to hear your thoughts!